FCS Checkout in 30 minutes. Final MMT (for nominal EOM) to be held at 10am Central with the aim to clear Discovery for re-entry via Late Inspections (DAT). Call up noting CO2 levels have risen on Discovery, but that's fine as Swanny says they've not changed out the Lioh canisters yet. In 7-13 of *which* checklist? 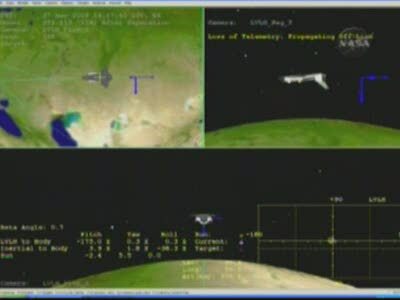 Software transition from G2 to G8 for on orbit checkout. 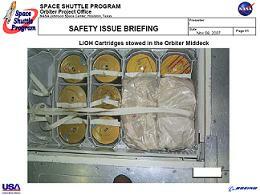 Orbit OPS C/L. Also has RCS Hotfire on page 10-2. Robert Pearlman asking about the cold bag timeline since they are calling up KSC only for the next two days. Jones: Those will last for EOM+2, so we'll be fine. We called up KSC only because of weather, we are hoping to land this weekend, and even though I didn't mention it, EDW will be great for the rest of the mission, through EOM+3. Pearlman following up with the Shelton family sending in flowers and how it'll touch MCC. Jones: It just doesn't feel right without them not there. 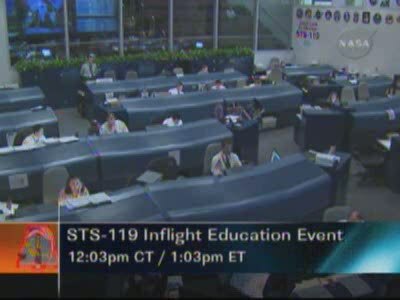 Bru and the STS-119 crew got to say a few words to them. Just the fact that the family pays attention to the ongoing activities in Space, it's a great honor. It's just a really good event, I'm happy to have met them today. Pearlman following up about the limiting consumable. Jones: The LiOH that scrubs the CO2 from the oxygen that the crew breathes. The other consumables do have a little more margin that we can use. Marcia Dunn about the BLT DTO: This will be happening about Mach 15, where over the water or where will Discovery be when this occurs? Jones: The Shuttle will be out over water and over the Gulf or the Atlantic. After South America, but before Cuba. Dunn: Where will the special aircraft come into play? How far will it read into the flight? Realtime data? Jones: Definitely after the flight that we hear about the readings. We'll be feeding them time and speed in real time. They know their ground tracks already. Dunn: How long will they be getting data from the plane? Will you have the same capabilities in EDW? Jones: From the California landing, I don't think so. It'll be on the order of minutes that we will be looking at this, and the view of the Orbiter will be limited due to the high mach. Bill Harwood: If you don't land on Saturday and Sunday, you will be landing somewhere on Monday, and Tuesday is your systems day? Jones: Correct. The good thing about Monday, is that we will call everything up. Tomorrow should be okay, but there is a front moving in. It'll have a factor with the cloud deck, and it'll be more of a factor on Sunday, but we should land. EDW will be fine if we need it on Monday. Harwood following up about the samples: Looks like you're fine on Monday to get them off, and Tuesday might be able to get stretched if you're in the freezer? Jones: Yeah. Monday will be our last good day. Tuesday will still have the data, but it will be degraded. Breaking away for the Expedition 19 docking, starting at at 7:45 AM CDT, docking at 8:14 AM EDT. This will be covered in the Expedition 19 thread live. SIMPLEX burn has been completed using both OMS. Lasted 12 seconds and changed the Shuttle's orbit by 22 FPS. Apogee from 225 NM to 217 NM. Perigee went from 211 NM to 208 NM. 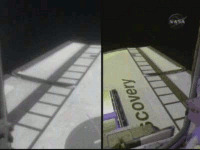 Looking down the OBSS side of the payload bay. As just noted by PAO, INCO is setting up the cameras to watch the radiator retract hoses when the payload bay doors are closed for landing tomorrow. KU-Band antenna stowage scheduled for a little over 2 hours from now. I am hoping for a good sighting of the shuttle tonight here in Colorado followed a couple minutes later by the station and it would be awesome if a few minutes after that the Soyuz flew by. Is there a site that lists Soyuz sighting opportunities? Yep, check the sightings thread here. No way. I want them home on Saturday the first opportunity. With a front moving in, no time like the present. EDW would be a shame ($1M) for shuch a flawless flight. Thanks for the covergae Ford, and others. nice to finally wind down a bit after such a hectic week! The KU antenna has been stowed. 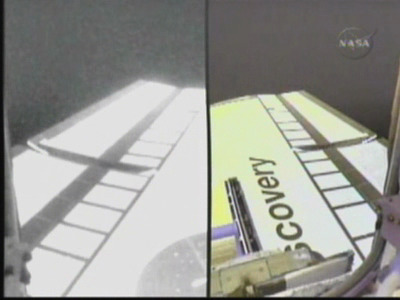 We'll not be seeing any more from Discovery until she lands.